Investigating the link between healthy reefs and shoreline stability, the researchers found that Grenville’s healthy reefs keep more than half of the bay’s coastline intact by reducing the wave energy arriving on shore. In contrast, severe reef degradation is linked with chronic coastal erosion in the northern section of the bay, where the shoreline is disappearing at a rate of nearly two feet every year. 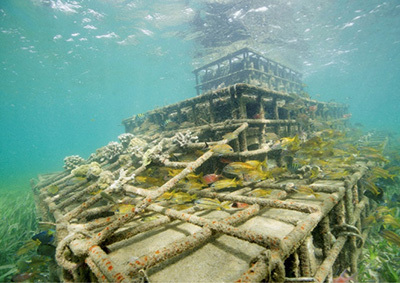 “We are able to apply coastal engineering tools and models to support reef science and management. 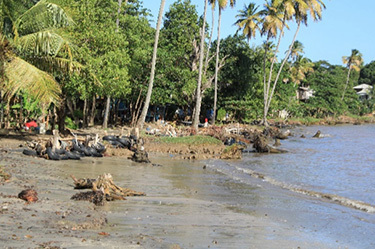 Ours is one of the first studies to directly show with evidence from the field sites and engineering models the impacts of reef loss on shorelines,” said lead author Borja Reguero, a researcher at the Institute of Marine Sciences at UC Santa Cruz. “Grenada has been at the front lines of climate change both in impacts and importantly as a leader among small islands and developing states in addressing these problems,” said AWE project lead Nealla Frederick. “Reef degradation destroys the natural breakwaters for tropical coastlines in the United States and across more than 60 other nations. Our study identifies how severe this problem can be, and we used that information to design an innovative reef restoration solution to help people and nature,” Beck said.